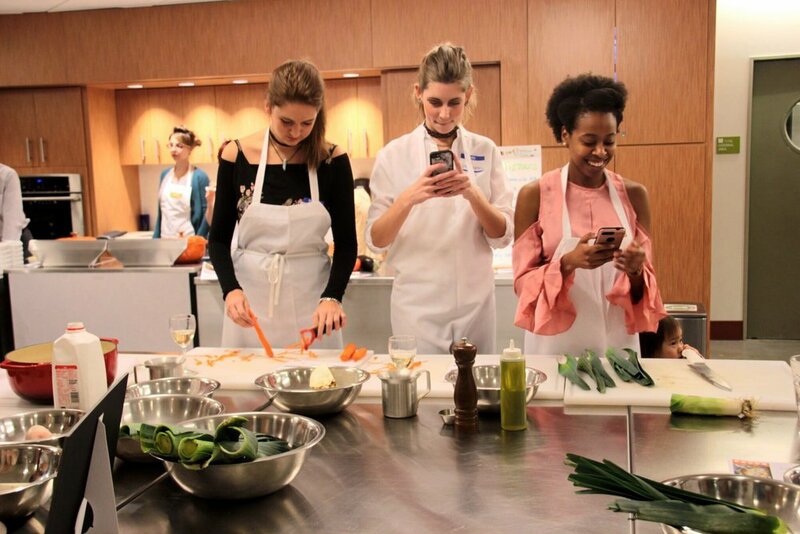 The other week, I was invited to join Just Add Cooking at Kitchen in Boston Public Market to try out their meals. Just Add Cooking is a Boston's only sustainable meal kit that sources ingredients from local vendors. A few of their founders told us all about their fresh and local approach to food. They source their ingredients locally and send them out the day they are packaged. After they described the Irish Smoked Haddock Chowder that we were going to make, they told us where our Haddock was from, and the name of the vessel and captain that caught it that morning. Coming from a college that emphasized sourcing and supporting local, I was immediately impressed. After we were briefed on our dishes, we split into groups and prepped and peeled the fresh vegetables and haddock. I am no chef by any means, and this meal was extremely easy for me to make. Not only did we have the ingredients on the table, but the step by step directions as well. After prepping and cooking our fresh ingredients, we got to try the Haddock Chowder that we made! It was so good! In addition to our meal, they also provided Butternut Squash Soup with Cacao Nib Crisps. Both soups were delicious and complimented each other well, the chowder was smokey and the squash was a sweet. The squash had savory caco nibs from Taza Chocolate on top, this threw me for a loop. Who would've that that savory chocolate tasted so good! If you want to make your life easier, healthier and tastier, I highly suggest trying Just Add Cooking! If you click this link, or type in BLOG30 at checkout, you'll receive $30 off of your order, which is a great deal on your first box! I just tried out my first box and it was easy and super tasty.